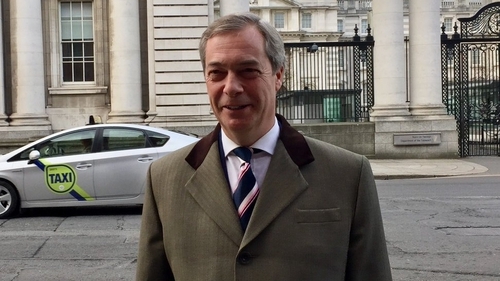 Former UKIP leader Nigel Farage has said he thinks there is a public appetite for Ireland to withdraw from the European Union. Speaking to RTE News, he said that "there are voices now in Ireland saying maybe the Brits are right about it. "There are lots of people in the professional media, civil service and political classes who love the European Union, but actually, if you go a few miles outside Dublin, it’s not all that pro-EU. I’ve never bought this argument that Ireland is totally pro-EU." Mr Farage also claimed that Irish people had told him "it’s about time we had a UKIP in Ireland". The UKIP MEP is in Dublin to speak at an event in Trinity College, and will also address an "Irexit" conference in the RDS tomorrow. That event is being organised by the Europe of Freedom and Direct Democracy group in the European Parliament. Mr Farage also said that Taoiseach Leo Varadkar is "taking Brussels’ side against Britain, and not the one in the best interest of his country". He also described Mr Varadkar as "a very charming man", "a smoothie", and "the Irish Blair".